This tutorial will show you how you can create and personalize HTML emails. HTML emails are different from plain text emails because they can be formatted just like Word documents using different fonts, colors, paragraphs, images and so on. HTML emails always have a text version and SalesAutopilot automatically creates that for you from the HTML version. Use the menu on the left to open the Communications folder and click the "Create new e-mail" link. 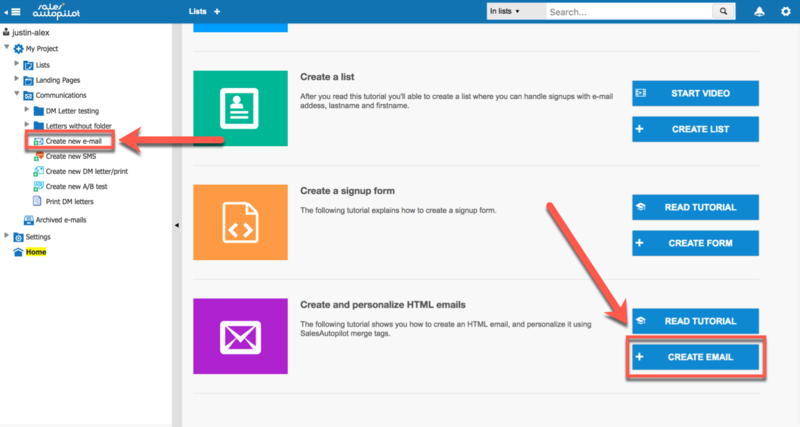 You can also access the create email wizard directly from your home page as shown in the picture below. Enter the name of your email. This is how the email will be listed in the menu. You can then choose to place your email in a folder. Select the "Formatted (HTML)" email type. 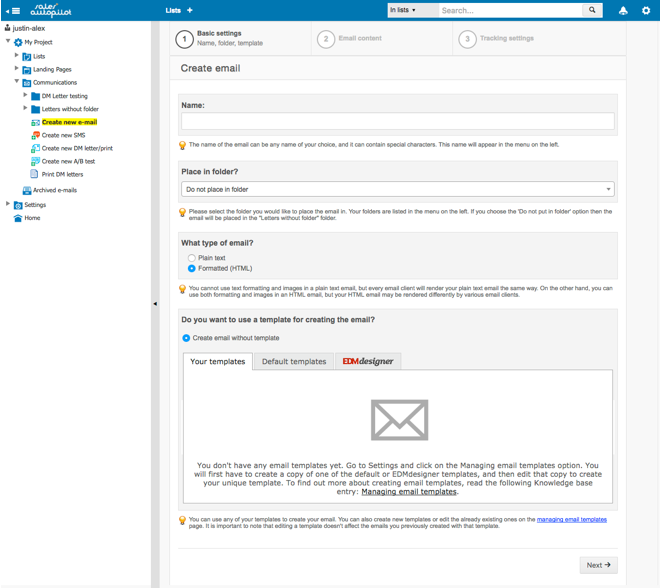 For now, don't change the default template setting from the "Create email without template" option. Creating email templates will be covered in another tutorial. Click the "Next" button. 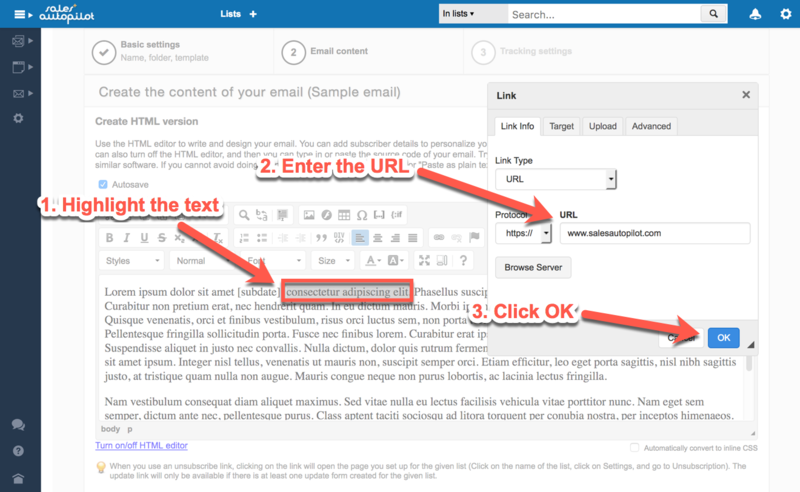 This will take you to the second page of the create email wizard where you can enter the content of your email. 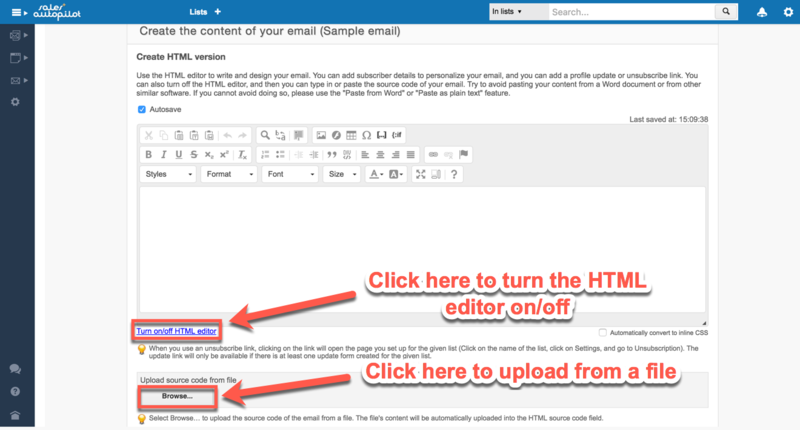 If you've already created your email in an HTML editor, turn off the built-in HTML editor using the link below the text area, and then paste the HTML source code, or click the "Browse..." button and upload the HTML source from your computer. The file's charset and character encoding have to be UTF-8. 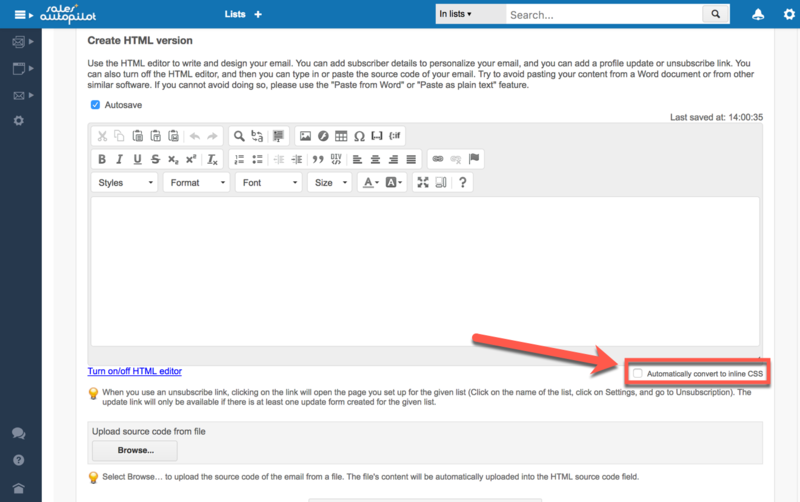 If you did not create the content of your email with another HTML editor, use the built-in editor to do so. As you edit your email, it will be automatically saved every minute. You can also turn off the autosave feature by unchecking the Autosave checkbox. The built-in editor is a simple WYSIWYG HTML editor. You can use it to format your text very similarly to Microsoft Office Word. 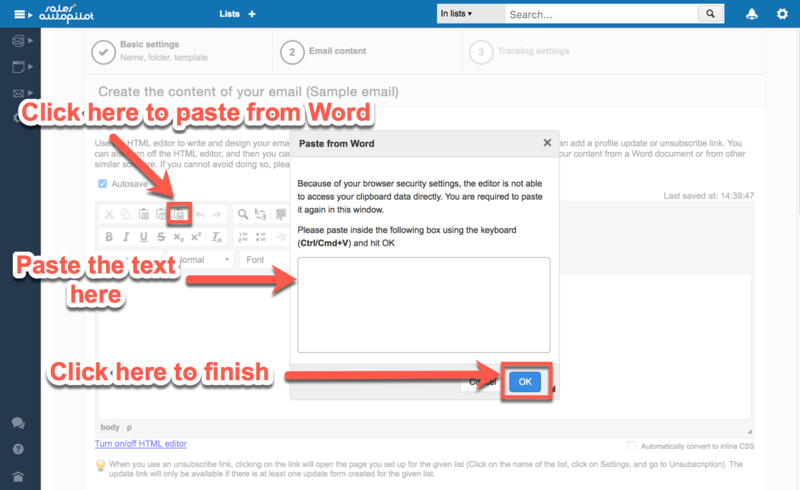 If you would like to copy-paste the content of your email from a Word document or other similar software, use the "Paste from Word" or "Paste as plain text" features of the built-in editor. Another handy little feature is that you can switch the editor to fullscreen mode as shown in the picture below. With the icon you can insert merge tags from the list (e.g. first name, email address, etc.) to personalize your email. The merge tag will be inserted where the cursor is currently located. For example, to insert a subscriber's first name, you would have to use the [mssys_firstname] merge tag. If you want to turn a section of your text into a hyperlink, highlight the given text, click on the icon, enter the URL, then hit the "OK" button. To remove the link, click anywhere inside the link's text, and then click on the icon. To insert an image into the email, click on the image icon, and then either upload the image or enter its URL. The image will be inserted at the current position of the cursor. Once you have finished editing / uploading the HTML version of your email, the next step is to create the plain text version. 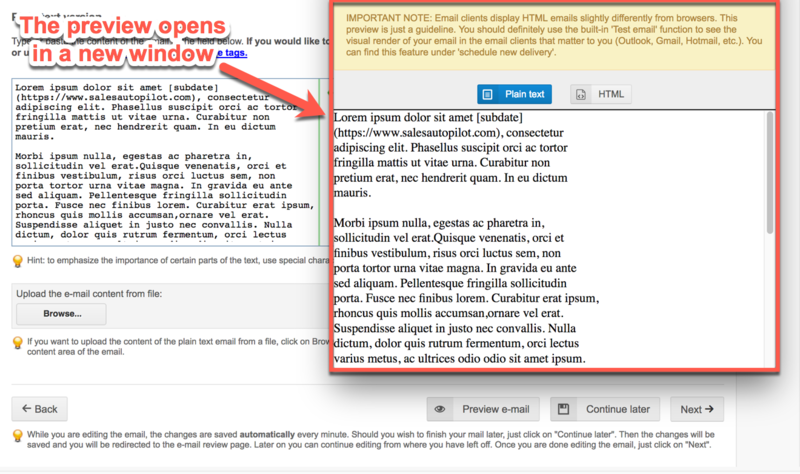 If a recipient's email client cannot display the HTML version, then they will see the plain text version instead. All you have to do is simply click on the "Create plain text version based on HTML" button and the software will automatically generate the plain text version. Scroll down to see the automatically created version. You may have to fragment the text manually by adding line breaks to keep within the recommended width. The recommended width will help with the readability of your email in most email clients. 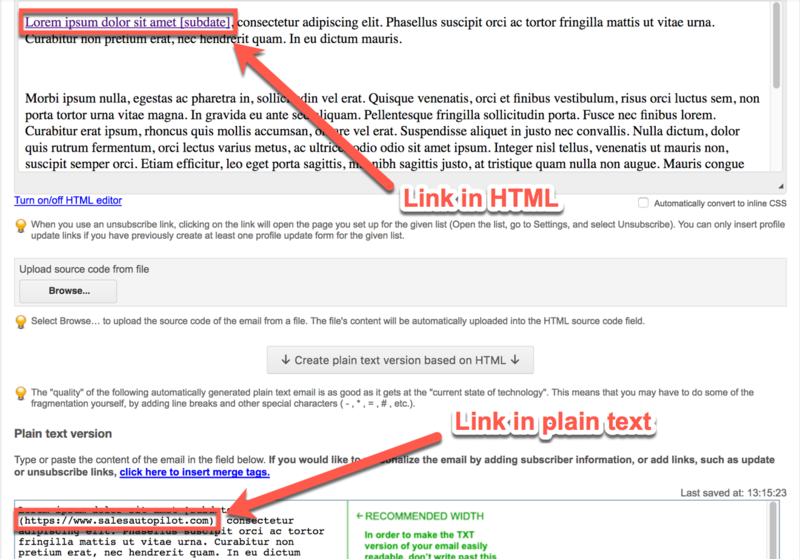 Hyperlinks will be converted into regular links automatically, as shown in the picture below. 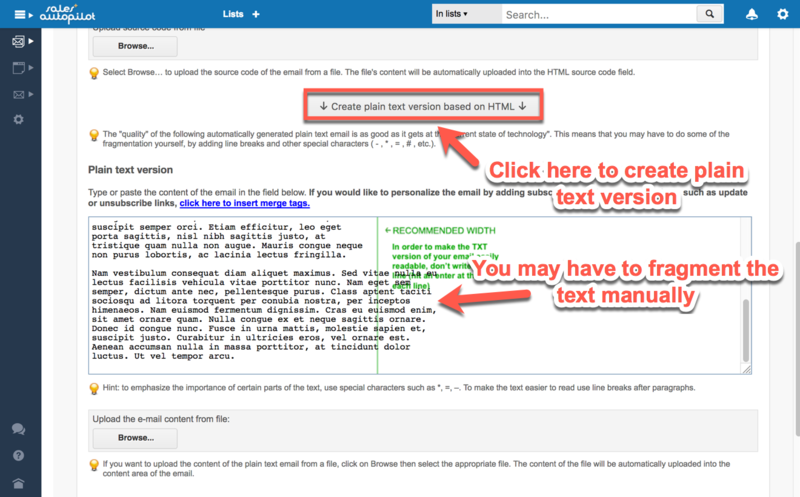 If you modify the HTML version, just click on the "Create plain text version based on HTML" button again. However, in that case you will have to fragment the email again. 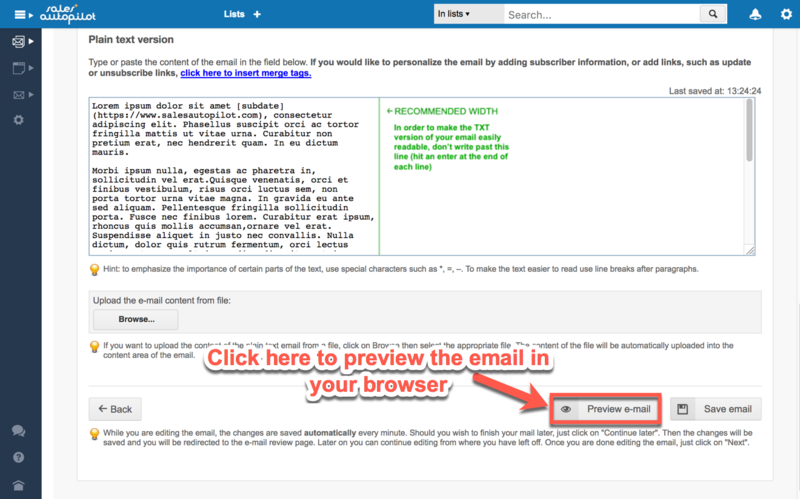 To preview your email preview in your browser, click on the "Preview email" button. The plain text version of the email will be displayed in a new window. Click the HTML button to view the HTML version. Important to note: email clients render HTML emails differently from browser to browser. Always test how the email is displayed by the most frequently used email clients. 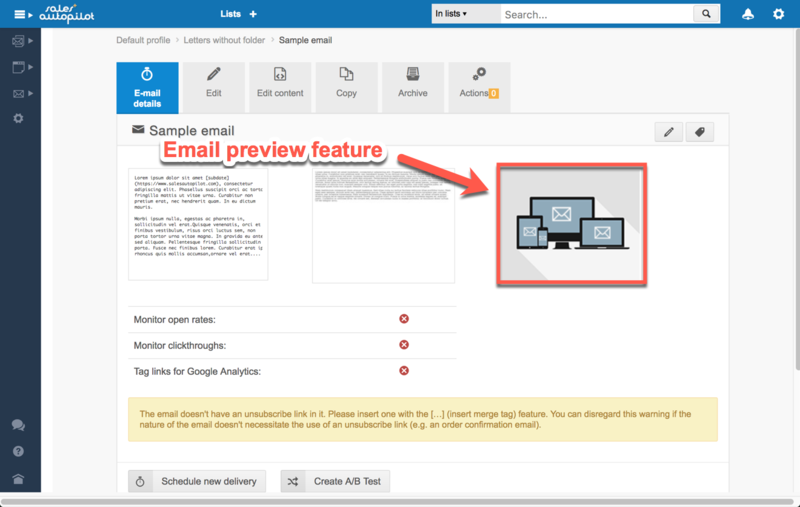 SalesAutopilot has a built-in feature that allows you to preview your email in different email clients. This can be found on the "E-mail details" page. We also recommend that you send a test delivery to yourself to see how the email is rendered. If you would rather continue editing the email later, click the "Continue later" button and SalesAutopilot automatically saves the current state of your email (both HTML and text), and then redirect you to the "E-mail details" page. The "Saved draft" text will show up after the name of the email, indicating that you didn't finish editing the email. To resume editing the email, click on the Edit content tab. 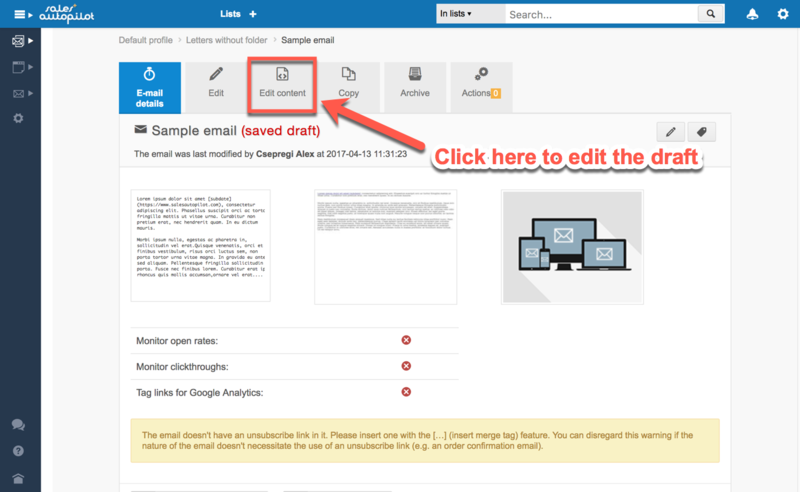 When you have finished editing the content of your email, click on the Next button to go to the third and last step of the create email wizard. 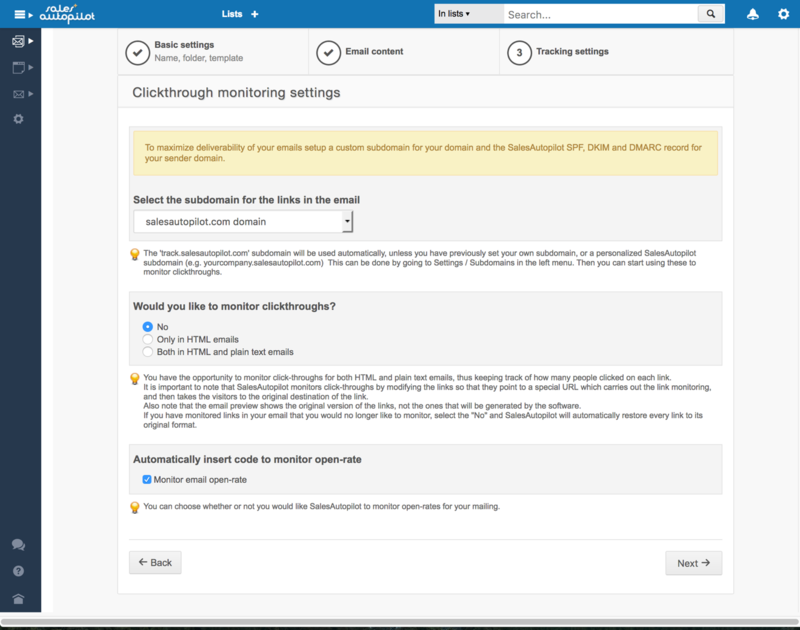 That's where you can set up clickthrough and email open monitoring. By default, clickthroughs are not monitored, but email opens are. 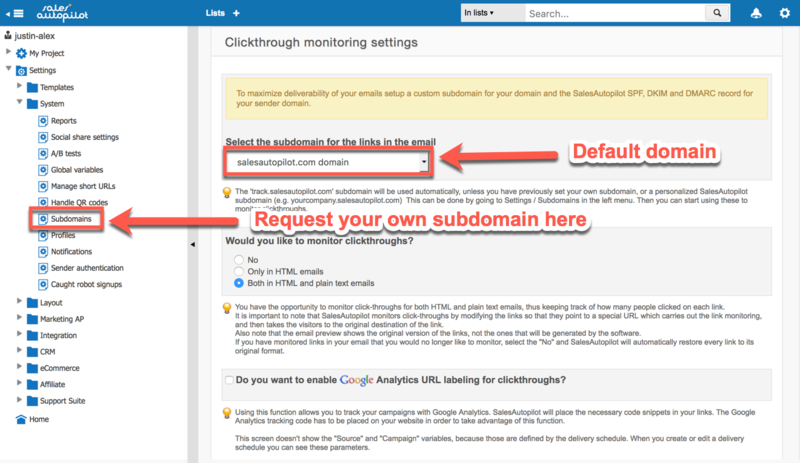 First, you can select the subdomain for the links in your email. By default, the salesautopilot.com domain is selected. However, to increase your email deliverability, we recommend that your create your own subdomain and use that instead. You can request subdomains and domain names by going to Settings / System / Subdomains. You have the opportunity to monitor clickthroughs for both HTML and plain text email, which allows you to know exactly how many readers have clicked on each of the links in your email. It is important to note that when you enable clickthrough monitoring, the software will automatically convert links into special URLs that carry out the monitoring and then redirect visitor to the original destination of each link. If there are links in the email that are already being monitored but you no longer wish to monitor them, select 'No' and they will be converted back to their original format. When you enable clickthrough monitoring a new option will appear, called Google Analytics URL labeling. This feature allows you to track your campaigns with Google Analytics. SalesAutopilot will place the necessary code snippets into your links. However, a Google Analytics tracking code must be in place on your site in order to take advantage of this feature. You can either use the default parameters or you can set your own custom parameters for labeling the URLs. The last option on this page is monitoring email opens, which is enabled by default. If enabled, SalesAutopilot will automatically place a piece of code in your email that will track whether it's opened or not. It is important to note, however, that it's not possible to measure email opens at 100% accuracy. The piece of code can only determine whether the email was opened if the recipient allows their client to display images. When you are done with the settings on this page, click on the Next button. This will redirect you to the "E-mail details" page, where you can preview the email. 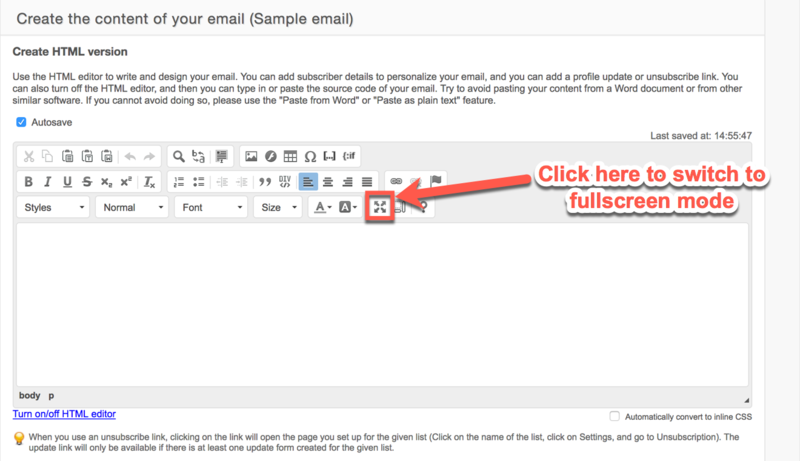 Click on the "Edit" tab to open the create email wizard. If you only want to edit the email's content, click on the "Edit content" link instead. Click on the "Archive" tab to archive the email. Before you could permanently delete an email, you first have to archive it. 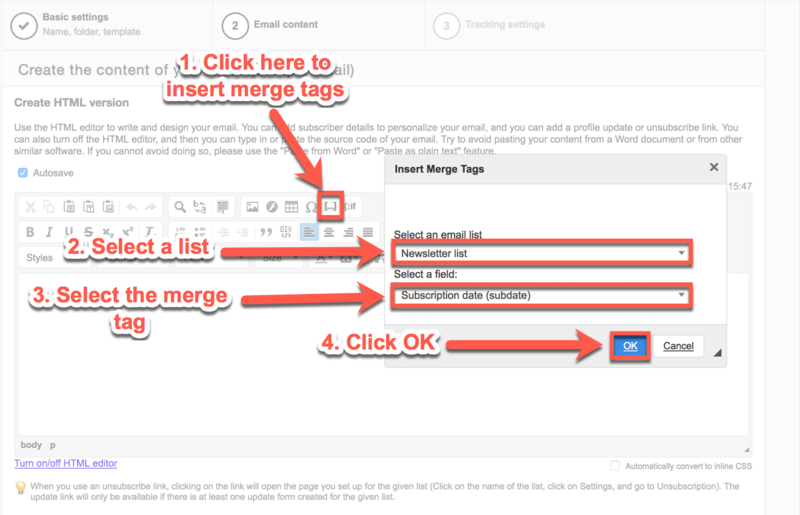 If you want to create a copy of the email click on the "Copy" tab. Once again, if you would like to test how 38 different different email clients will render your email click on the "Email preview test" picture. 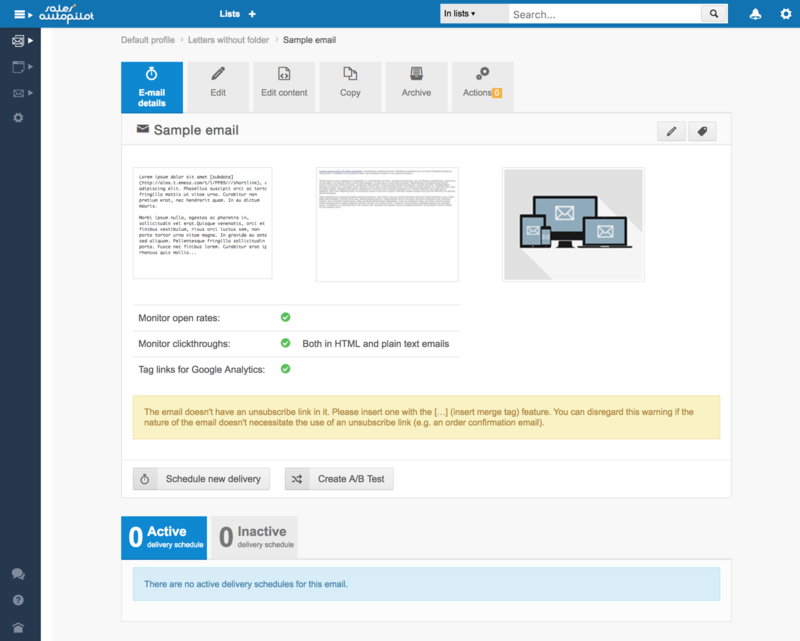 This feature does come with an additional cost of 4 EUR, but it is an extremely useful test that we recommend you use at least once for each of your email templates. You can also schedule new deliveries and A/B tests on this page. You can create as many delivery schedules for a particular email as you would like. This is a very unique feature which allows you to create numerous different and flexible marketing automation processes with SalesAutopilot.